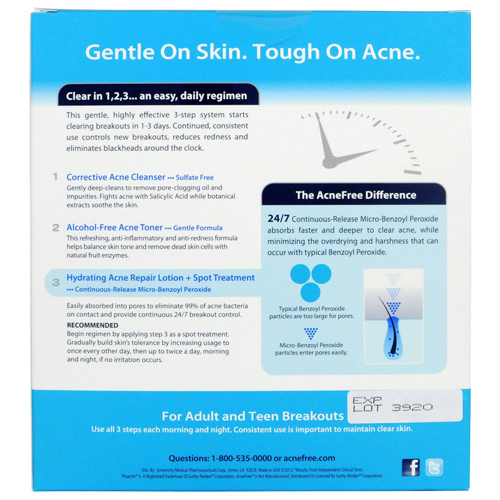 For Adult and Teen Breakouts. The AcneFree Sensitive Skin 24 Hour Acne Clearing System is the only acne clearing regimen designed for sensitive skin. 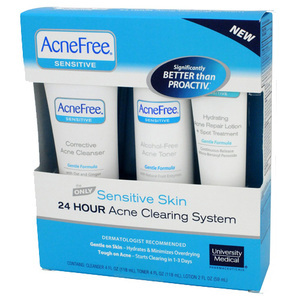 Consistent use controls new breakouts, reduces redness and eliminates blackheads around the clock. 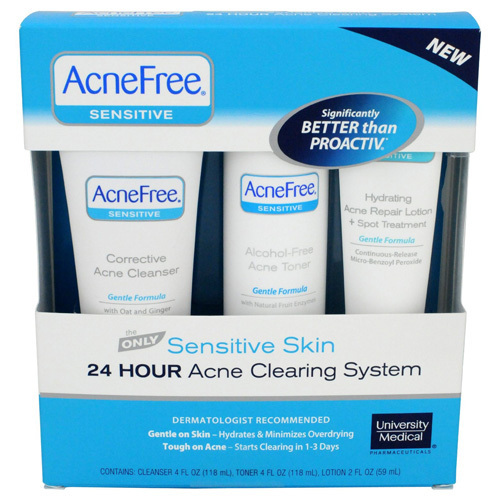 The AcneFree Sensitive Skin 24 Hour Acne Clearing System includes Corrective Acne Cleanser, Alcohol-Free Acne Toner and Hydrating Acne Repair Lotion + Spot Treatment. This gentle, highly effective 3-step system starts clearing breakouts and helps prevent new breakouts before they start. Continued, consistent use controls new breakouts, reduces redness and eliminates blackheads around the clock. This gentle, highly effective 3-step system starts clearing breakouts and helps prevent new breakouts before they start. Continued, consistent use controls new breakouts, reduces redness and eliminates blackheads around the clock. 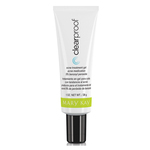 Gently deep-cleans to remove pore-clogging oil and impurities. Fights acne with Salicylic Acid while botanical extracts soothe the skin. 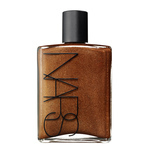 This refreshing, anti-redness formula helps balance skin tone and remove dead skin cells with natural fruit enzymes. Easily absorbed into pores to eliminate acne bacteria and provide continuous breakout control. For external use only. 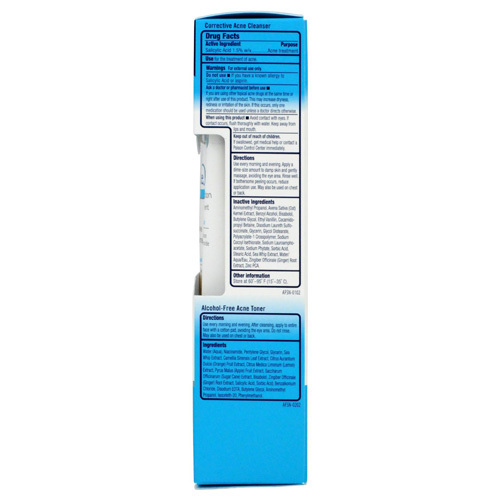 Do not use if you have a known allergy to Salicylic Acid or aspirin. Ask a doctor or pharmacist before use, if you are using other topical acne drugs at the same time or right after use of this product. This may increase dryness, redness, or irritation of the skin. If this occurs, only one medication should be used unless a doctor directs otherwise. When using this product, avoid contact with eyes. If contact occurs, flush thoroughly with water. Keep away from lips and mouth. Keep out of reach of children. If swallowed, get medical help or contact a Poison Control Center immediately. For external use only. 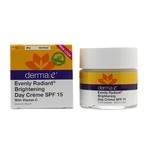 Do not use if you are sensitive to Benzoyl Peroxide or have very sensitive skin. This product may cause irritation. Ask a doctor or pharmacist before use, if you are using other topical acne drugs at the same time or right after use of this product. This may increase dryness, redness, or irritation of the skin. If this occurs, only one medication should be used unless a doctor directs otherwise. When using this product, avoid contact with eyes. If contact occurs, flush thoroughly with water. Keep away from lips and mouth. Avoid unnecessary sun exposure and use a sunscreen. Avoid product contact with hair and dyed fabrics, including carpets and clothing, which may be bleached by this product. Stop use and ask a doctor if excessive irritation occurs. Keep out of reach of children. If swallowed, get medical help or contact a Poison Control Center immediately. Use twice a day, every day, for clear skin that stays clear. Recommended Use: Use as a spot treatment to start. Before using all-over face, gradually build skin's tolerance by applying once every other night, then increasing application up to twice a day, morning and night. Active: Salicylic Acid 1.5% (w/v). Inactive: Aminomethyl Propanol, Avena Sativa (Oat) Kernel Extract, Benzyl Alcohol, Bisabolol, Butylene Glycol, Ethyl Vanillin, Cocamidopropyl Betaine, Disodium Laureth Sulfosuccinate, Glycerin, Glycol Distearate, Polyacrylate-1 Crosspolymer, Sodium Cocoyl Isethionate, Sodium Lauroamphoacetate, Sodium Phytate, Sodium Chloride, Sorbic Acid, Stearic Acid, Sea Whip Extract, Water, Zingiber Officinale (Ginger) Root Extract, Zinc PCA. Water, Niacinamide, Pentylene Glycol, Glycerin, Sea Whip Extract, Camellia Sinensis Leaf Extract, Citrus Aurantium Dulcis (Orange) Fruit Extract, Citrus Medica Limonum (Lemon) Extract, Pyrus Malus (Apple) Fruit Extract, Saccharum Officinarum (Sugar Cane) Extract, Bisabolol, Zingiber Officinale (Ginger) Root Extract, Salicylic Acid, Sorbic Acid, Benzalkonium Chloride, Disodium EDTA, Butylene Glycol, Aminomethyl Propanol, Benzyl Alcohol, Isoceteth-20. 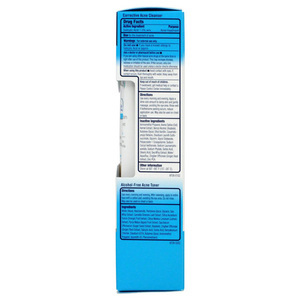 Active: Benzoyl Peroxide 3% (w/v). Inactive: Allantoin, Bisabolol, Butylene Glycol, C13-14 Isoparaffin, Propylene Glycol, Tocopherol Ethyl Macadamiate, Glycerin, Jojoba Esters, Laureth-7, Melaleuca Alternifolia (Tea Tree) Leaf Oil, Methyl Methacrylate/Glycol Dimethacrylate Crosspolymer, Methylisothiazolinone, Phenoxyethanol, Polyacrylamide, Propanediol, Propylene Glycol, Tocopherol, Sea Whip Extract, Sodium Hyaluronate, Sodium Hydroxide, Water, Zingiber Officinale (Ginger) Root Extract.